This spoon busked corset is constructed using alternative panels of maroon and mushroom cotton twill. The corset is stiffened with corded panels used vertically in the front sections over the bust and horizontally over the hips. Cording was a popular method often used in addition and as an alternative to whalebone. Cording was the application of sandwiching twisted cord (usually hemp, cotton or paper) between two layers of fabric. As the cords were inserted they were stitched in place on either side. Once the cloth was constructed the shaped panels could be cut. Depending on how the panels were cut the direction of the cording could be controlled. As in the case of this example cording was also viewed as a design detail. The corded panels provided suppleness to the gament whilst still controlling the wearer's figure. The corset is boned in chanels of 3. The front section of boning finishes at the corded panel whereas the side of the corset features an external chanel running from top to bottom which breaks up the corded sections. The corset is trimmed with lace at the upper edge and also heavily decorated with contrast thread flossing over the bone casings at both top and bottom. It can also be seen over the corded bust panel. The bottom edge is machine bound. The centre back of the corset features 12 pairs of brass eyelets evenly spaced for the lacing. The spoon busk used at the centre front comprises of two parts and features 4 hook and eye closures. The design was distinctively wider at the lower edge and dished inward, going over the abdomen. The theory was the cupped metal shape would offer firm support md protection for the wearer's lower organs. 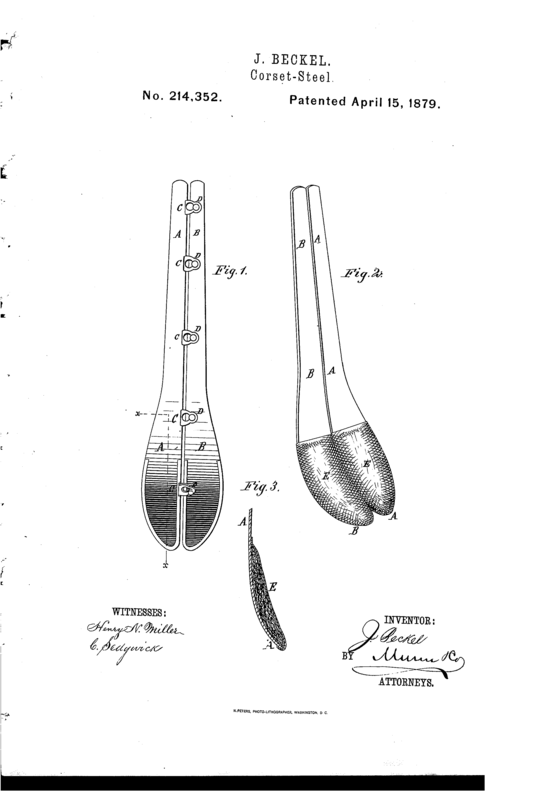 The spoon busk was patented by Joseph Bekel in 1879 although there are plenty of early examples from the 1870's featuring this innovation. With the combination of the cording and boning with the spoon busk made the corset heavier and a more restrictive garment. The spoon busk was a popular feature in corsets until the late 1890's. Corset-Steel. No. 214,352. Patented April I5, 1879. WITNESSES: INVENTOR: WMWQKM ZQ 0/7 B x uAA/vw A'TTSENEYS. JOSEPH BEOKEL, OF NEW YORK, N. Y.
Specification forming part of Letters Patent No. 214,352, dated April 15, 1879 application filed March 14, 1879. "Be it known thar I, JOSEPH BECKEL, of the city, county, and State of New York, have invented a new and useful Improvement in Corset-Steels, of which the following is a specification. Figure 1 represents the outer side of a set of corset-steels to which my improvement has been applied. Fig. 2 is a perspective view of the inner side of the same. Fig. 3 is a detail section of the same, taken through the line as m, Fig. l.
The object of this invention is to furnish steels for long corsets which shall be so constructed as to prevent their lower ends from hurting their wearers when the said wearers are sitting down. The invention consists in steels for long corsets, having their lower ends bent inward, and provided upon their inner sides with pads, as hereinafter fully described. A B represent a set of corsetsteels, which are secured to each other by loops 0 and pins or knobs D, in the usual way. The lower ends of the steels A B are bent inward slightly, and have pads E attached to their inner sides, as shown in Figs. 2 and 3. By this construction the pads E will prevent the lower ends of the steels A B from hurting the wearer when she sits down. With this construction long corsets can be worn with ease and com fort, so that the advantages from their use can be had without the annoyance hitherto experienced by their wearers when sitting down. Having thus described my invention, I claim as new and desire to secure by Letters Patent- Steels A B for long corsets, having their lower ends bent inward, and provided upon their inner sides with pads E, substantially as herein shown and described."